Looking for the selfie mirror photos from an event you attended? Click Here to retrieve them. 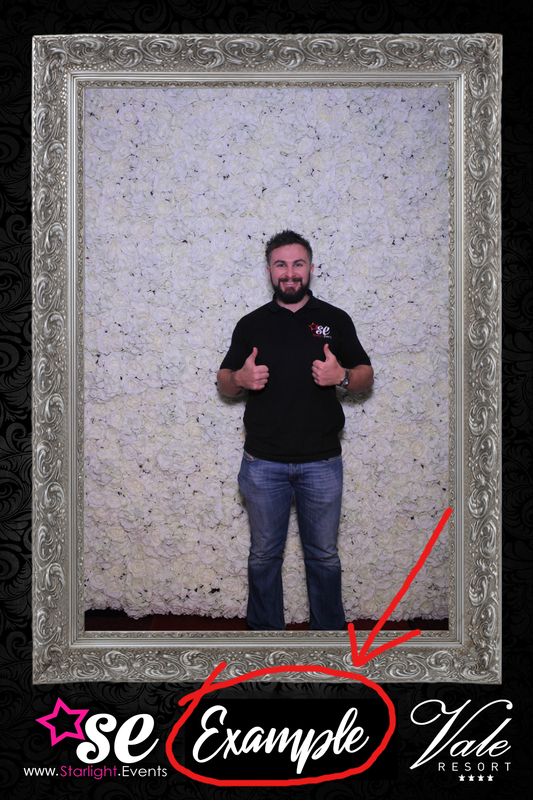 We offer clients the choice between a Magic Mirror Selfie Booth and a Photo Booth, this page is dedicated to the Magic Mirror Booth we offer. Largest touch screen 4k image around – ALL of our competitors use a smaller lower resolution screen. Super smooth animations on fantastic industry leading software. Prop Hire laid out by category (hats, beards, glasses etc.) on our smart looking tables. Photos Uploaded in full quality to a secure online folder for you to share with your guests / colleagues / attendees. Friendly Selfie Mirror Attendant to assist guests and replace ink / paper if required. 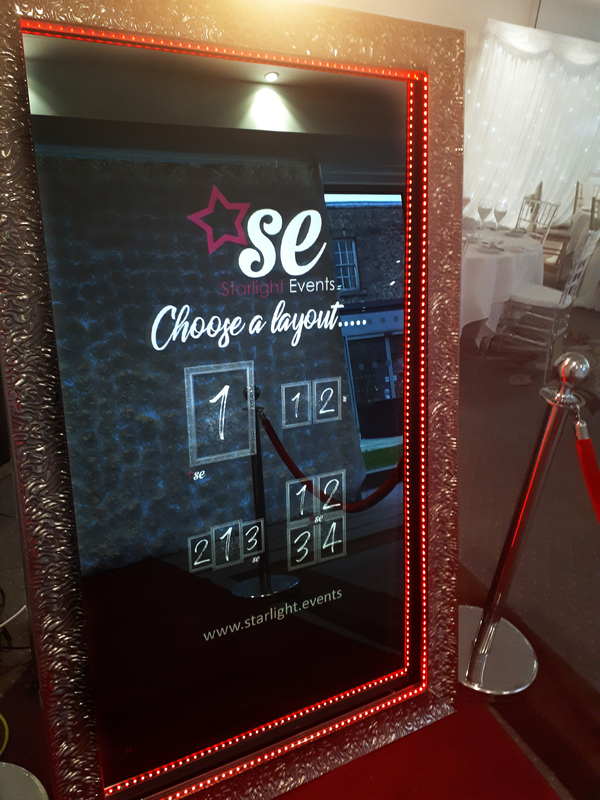 We have a number of frames for our magic mirror photo booth to choose from and the LED light colour is adjustable to suit your event. 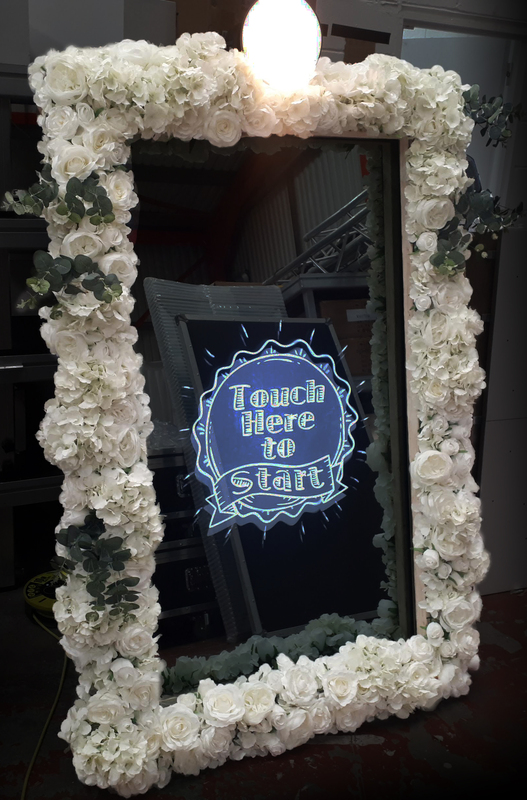 Below is a photo of our magic mirror photo booth with red LED lighting. There are different manufacturers of Magic Selfie Mirrors in the UK. We chose the most expensive, which is over 7 times the price of the cheapest. What’s the difference between them? Some are a different size – ours are the biggest. Some are slimmer – not much use if you can’t see all guests in the mirror before the photo is taken! Some aren’t even touch screen!!! Yes, we’ve seen some that have a button at the bottom you have to press. Some have a cheap flexible front – ours have toughened glass. Some have no animations at all, just page after page of static images. If all you’re looking for is a magic mirror booth, then all of the above could claim they are, the end product and service though will not be the same. We’ve invested time and money putting together the best possible combination of components to create our selfie mirrors. From the lightning fast custom built computer running the software in the background to the 4k ULTRA HD TV hidden behind the mirrors, so big that we had to take off the bezel to make it fit within the selfie mirror case! What’s the point in having a massive 70″ mirror if the TV behind it is tiny? We also use custom camera settings and custom lenses for the perfect shot every time. The custom built computer has dedicated graphics supplying the 4k screen, it’s built to a purpose meaning the graphics and software literally glide in front of your eyes. As the processing of the photos taken is also done by the computer, it means that prints are also faster too! It takes just 8 seconds from the moment you press print, to your first print being delivered from the printer! It’s that fast! Do we sacrifice quality for speed? No! Our printers are sub Dye, meaning there’s absolutely no difference in speed printing a low quality image to a high quality one, so it’s our custom built computers that are the result of our great prints once again. You get to add your OWN CUSTOM TEXT to your magic mirror prints as shown in the example below. The text you add will be used by your guests to gain access to a digital copy of the image after the event. They simply type it in to the box provided in the log in page.